Newly elected San Diego City Councilman Chris Cate and three re-elected members were sworn in Wednesday in a special ceremonial meeting of the council in Golden Hall. “I’m really excited to begin serving the neighborhoods and residents of District 6. I’m honored to be your council member” said Cate, who received a standing ovation. Also sworn in to new terms were David Alvarez, Myrtle Cole and Lorie Zapf. 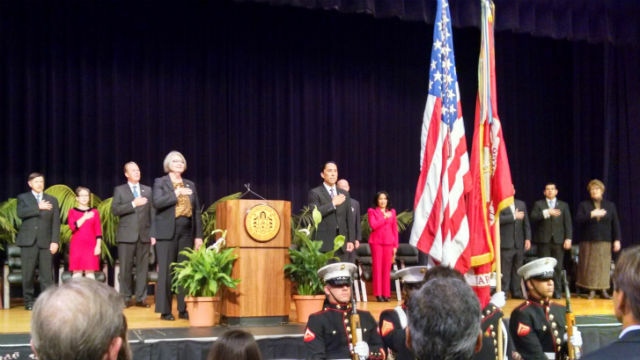 Council member Sherri Lightner led the pledge of allegiance before a crowd of hundreds of government and civic leaders, and Mayor Kevin Faulconer thanked Ed Harris for his eight months of service representing District 2 following redistricting. Harris called the service a “deeply rewarding” experience, and was given a standing ovation after brief remarks. Cate, who was the vice president of the San Diego County Taxpayers Association, won the runoff election last month for District 6, which includes Mira Mesa, Miramar, Kearny Mesa and parts of Clairemont Mesa and Rancho Penasquitos. He is a former council staff member for Faulconer. Sworn in for second terms were former mayoral candidate Alvarez, who represents Barrio Logan and South San Diego communities, and Zapf, who had represented District 6. She shifted over to District 2 — Point Loma, Mission Bay, Bay Park — for reelection because of a shift in City Council boundaries. He called for spending decisions to be based on data and need rather than politics, and said it was time to consider new sources of revenue. “In my second term I will advocate that we prioritize city spending decisions based on performance metrics and data,” he said. Cole will begin her first full term on the panel, representing Southeast San Diego. She took office last year after a special election that followed the resignation of Tony Young.